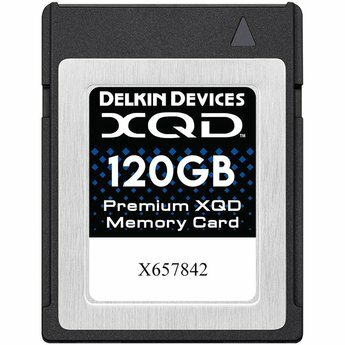 Designed for professional photographers and videographers, the 120GB Premium XQD Memory Card from Delkin Devices is made to excel in high-end cinematic hosts, including models from Nikon and Sony, and offers a storage capacity of up to 120GB. Designed for professional photographers and videographers, the 120GB Premium XQD Memory Card from Delkin Devices is made to excel in high-end cinematic hosts, including models from Nikon and Sony, and offers a storage capacity of up to 120GB. Equipped with a PCIe 2.0 interface, XQD Format Version 2 compliance, and EB Stream functionality, this Premium XQD card features read speeds of up to 440 MB/s and write speeds of up to 400 MB/s, allowing it to record DCI 4K (4096 x 2160) and Full HD (1920 x 1080) video at up to 180 fps, and up to 200 continuous raw still image bursts. As with most Delkin cards, this memory card is shockproof, magnet proof, X-ray proof, anti-static, UV-guarded, and resistant to extreme temperatures, allowing you to take this card with you into extreme environments, such as snow and deserts. For additional protection, this card has also been serialized. In the case of damage, Delkin backs this card with a limited 48-hour replacement guarantee and a limited lifetime warranty. Included is a protective storage case.